Air Niugini successfully hosted the 2nd annual ‘Air Niugini Kokoda Cup’ match in a colourful ceremony on Sunday, 27th May at the National Football Stadium in Port Moresby, coinciding with the Round 12 match of the Queensland Intrust Super Cup between SP PNG Hunters and Townsville Blackhawks. The cup was carried onto the field by former Kumuls and staff member of Air Niugini Properties Department, Richard Wagambie, accompanied by ANG cabin crew in uniform. In his early days, Richard played A Grade football with Paga Panthers, Tarangau and the Carpentras Rugby League Club in France. Whilst with Kumuls, he played 8 Test matches which included tours to New Zealand, England, France and Australia. Wagambie’s involvement in rugby league spans 35 years as a player, administrator and coaching stints with the Vipers, the junior Kumuls and the PNG Residents team. Officiating at a brief ceremony prior to the commencement of the game was Deputy Chairman of the Board of Air Niugini Limited, Mr Andrew Nui, the airline’s Acting CEO, Mr Tahawar Durrani, Chairman of the PNGRFL Board, Mr Sandis Tsaka and CEO of PNGRFL Mr Reatau Rau. Also present were Chairman of the SP PNG Hunters, Mr Graham Osborne, Mr Marco McConnell and Mr Dominic Kaumu, both of who also represented the Executive Management of Air Niugini. Mr Nui explained that Kokoda Cup match continues to honour the Battle of Kokoda as well as marked the 02nd anniversary of Air Niugini’s direct flights between Port Moresby and Townsville, home base for the Townsville Blackhawks. He acknowledged the Executives of the Queensland Rugby League, the Intrust Super Cup competition and PNGRFL for permitting Air Niugini to host this game within the regular round of the ISC Cup Draw. He also thanked everyone for attending and supporting their favourite team. PNGRFL Chairman, Mr Tsaka thanked Air Niugini for its continuous support towards the SP PNG Hunters as well as rugby league in general in PNG with discounted airfares for their travel. 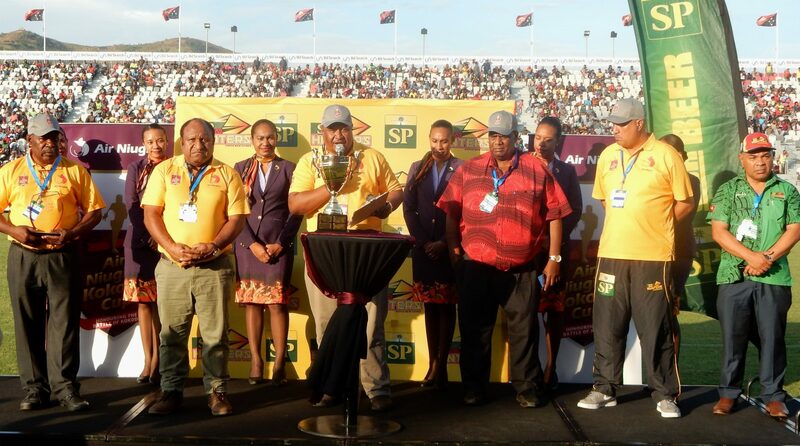 The SP PNG Hunters retained Air Niugini Kokoda Cup after defeating Townsville Blackhawks, 12-8. The Air Niugini Kokoda Cup Match is an annual event played in recognition of the airline’s direct services between Port Moresby and Townsville and also commemorates the Battle of Kokoda, an important event in the history of PNG and Australia.